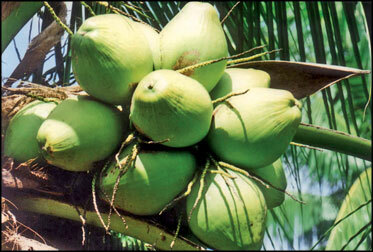 Coconut Development Authority (CDA) declares that export earnings from coconut products amounted to Rs. 13,637 million over the first half of 2009 and it was a substantial increase by 35 per cent as compared to the corresponding figure of Rs. 10,158 million in 2008. The same positive momentum is envisaged to continue even during the 2nd half of 2009 and it is expected to earn Rs. 30 billion as foreign exchange from exports of coconut products in 2009. Keerthi Sri Weerasighe, Chairman, CDA stated that this achievement has been made despite a strong global recession and negative economic growth scenario in many importing countries. Especially the huge demand for Coconut fibre and fibre products from China has triggered the activities of Fibre industry to an unprecedented level. The export earning from mattress, Bristle and Twisted fibres showcased 75 per cent growth during the period under review as against the relevant earnings of 2008. Other than China countries like South Korea(4,357mt), Germany (2,825mt), Japan (2,541mt), Poland (1,493mt) had been import significant quantities of coir fibre. At the same time export earnings from Coconut Kernel Products such as Desiccated coconut, Coconut cream, Coconut milk powder, Coconut oil, Poonac etc. amounted to Rs. 6,204 million and this was an increase of 62 per cent against the corresponding earnings of the previous year. Desiccated coconut was mostly exported to U.A.E. (4,300mt), Egypt (2,539mt) Saudi Arabia (2,372mt) Pakistan (1,255mt) and Coconut Milk Powder was mostly exported to U.A.E. (390mt), Jamaica (214mt), U.K. (172mt) and Belgium (152mt). Leading importers of Coconut Milk and Cream were Germany (744mt), U.K. (688mt), Netherlands (141mt) and Canada (125mt). Meanwhile, export of Coconut Shell products remained steady and registered a positive note of 32 per cent growth during the period under review against the year 2008. The demand for Activated carbon envisaged to increase strongly in the near future due to new possible applications. However exports of value added coir products experienced a marginal set back by about 3 per cent in terms of value as compared to year 2009 as a reflection of economic recession in developed countries. Chairman, Coconut Development Authority, Keerthi Sri Weerasinghe stated that CDA has implemented number of programmes to uplift the coconut industry and to boost the demand for coconut products under Mahinda Chintana with the guidance of D.M. Jayaratne, Minister, Plantation Industries. Especially as a measure to exploit the export market and to step up the foreign investment, number of discussions and meetings were held with foreign delegations during the period under review.